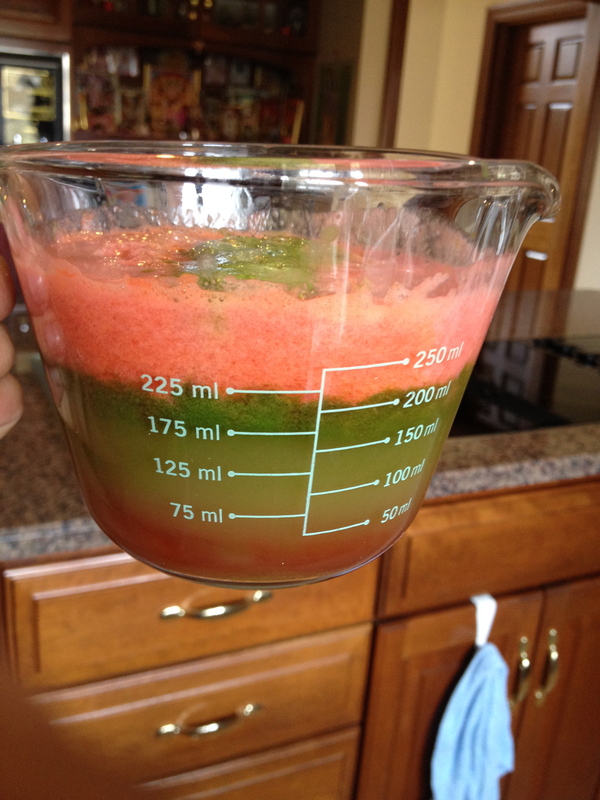 I love juicing just about anything, and trying new concoctions when I am able to be near my juicer. When I am not, I resort to my local Whole Foods green juices, or grab a pack of freeze dried juice to go. Whether or not the juice is green, orange, red or brown when all mixed up, I love that fresh taste first thing in the morning. Here’s a great summer juice recipe to keep you going all day long, which is packed with super foods and other yummy treats which are in season. I try not to juice too many fruits and add more veggies, but in the summer when there are so many good things out there, I can’t resist. Juice in juicer if you have one or combine for a delicious smoothie! Stir and drink up! (It’s prettier when its not mixed, but just as tasty when it is mixed). Cheers!